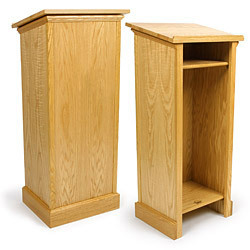 These light oak pulpits feature a water resistant coating that preserves their attractive finish. 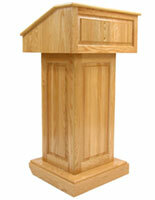 Each lectern will last for years because it is made of durable wood and plywood. The floor standing oak pulpits feature a shelf for storage and a larger area beneath it for keeping more supplies. 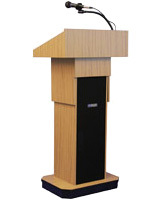 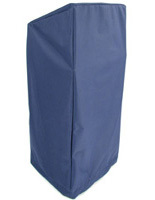 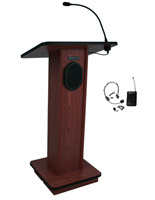 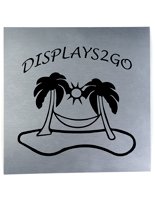 The water resistant podiums also come with a reading surface for holding presentation materials. 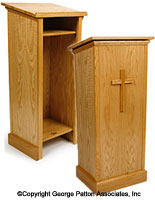 With these wood pulpits, some assembly is required, but only by affixing the ledge to the bodywith (4) included screws. The floor standing lecterns with storage space are also available in darker finishes and with the option of a front mounted cross.